The term “Weapons-Grade” is typically used to describe nuclear material, such as uranium or plutonium, that’s rich enough to be weaponized. 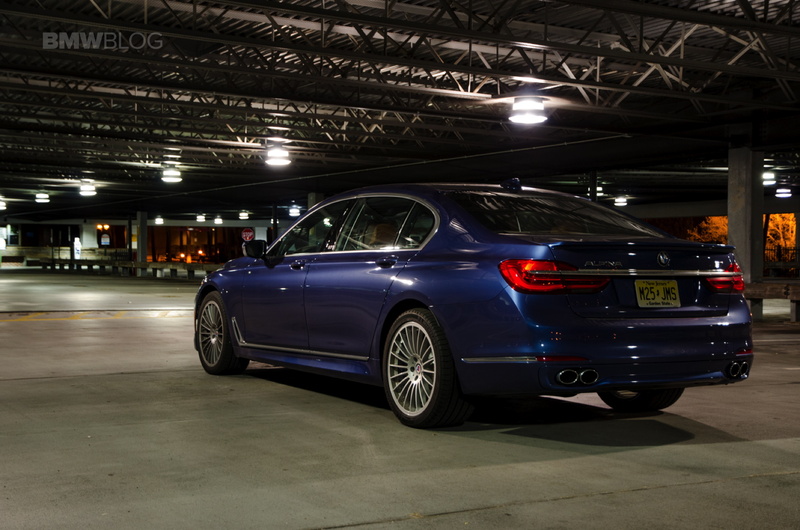 And I honestly can’t think of a single better term to describe the ALPINA B7 Bi-Turbo. 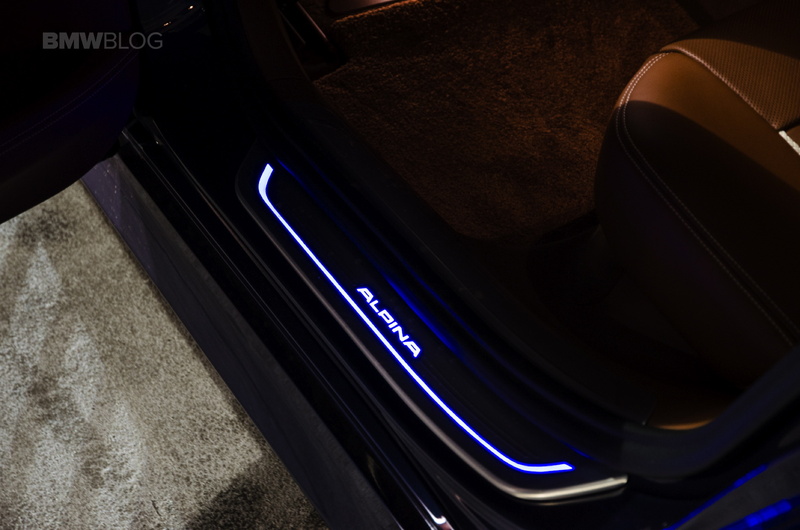 What the folks at ALPINA have done is take a BMW 7 Series and enrich it to the point of becoming weaponry. 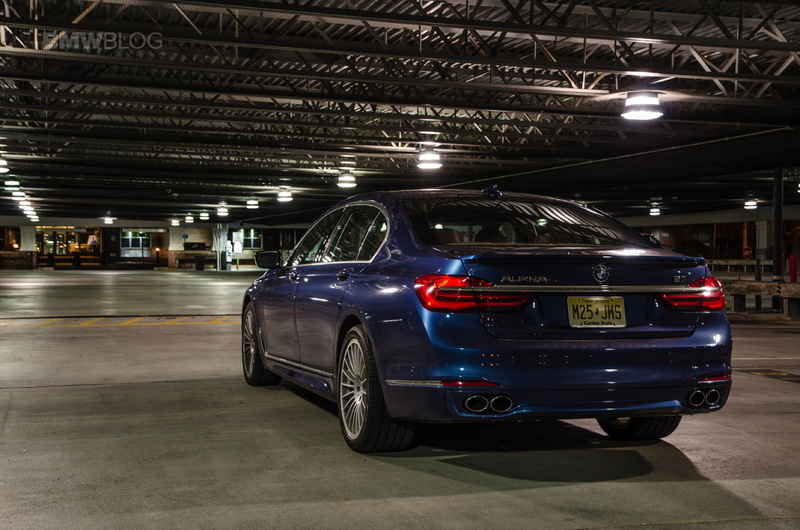 If the BMW 7 Series is pure, elemental uranium than the ALPINA B7 is a fully functioning nuclear cruise missile. 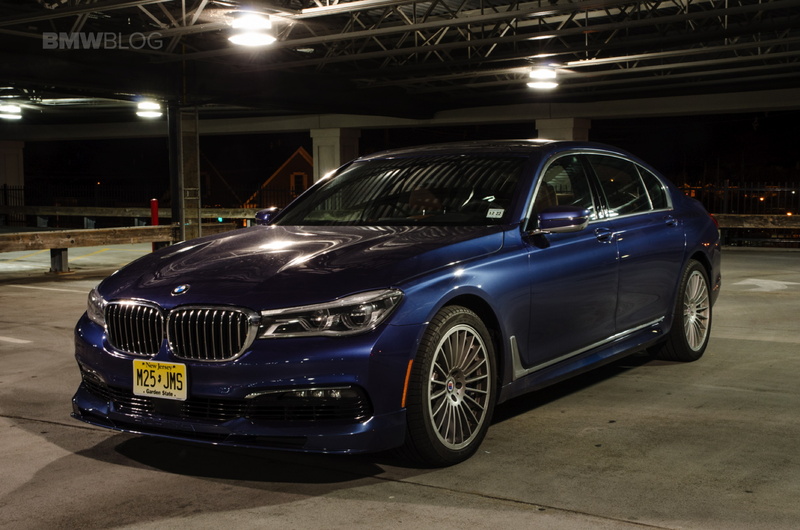 The differences between the two cars truly feel that vast and the B7’s performance borders on violent. And it’s wonderful. I can still remember the moment I got the email. 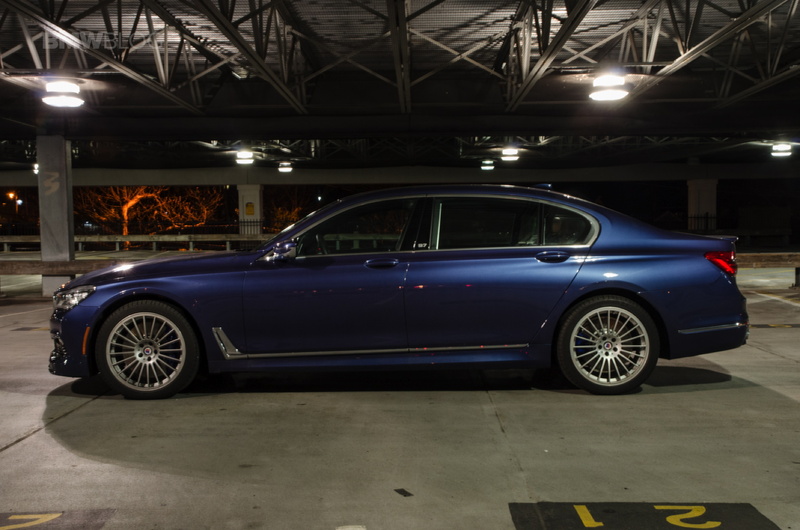 It was a typical day of bothering the people at BMW to see if we could borrow a car to test. 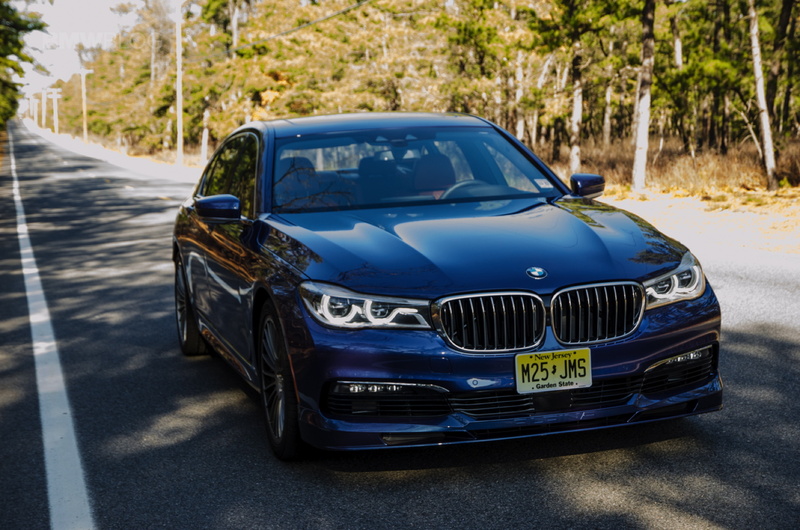 We usually try and get one of the newest cars available, so as to bring you fine readers reviews of the most current Bimmers. But then I received a more unusual email than normal. 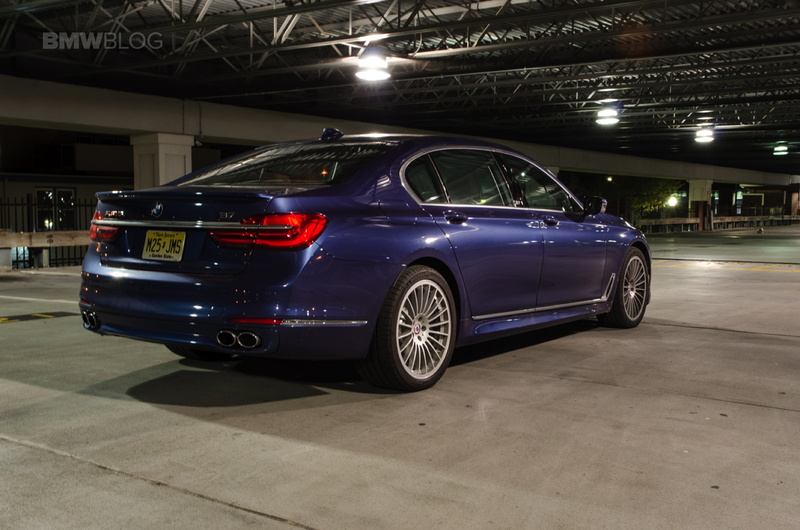 “We have an ALPINA B7 available”. I almost jumped out of my shoes. 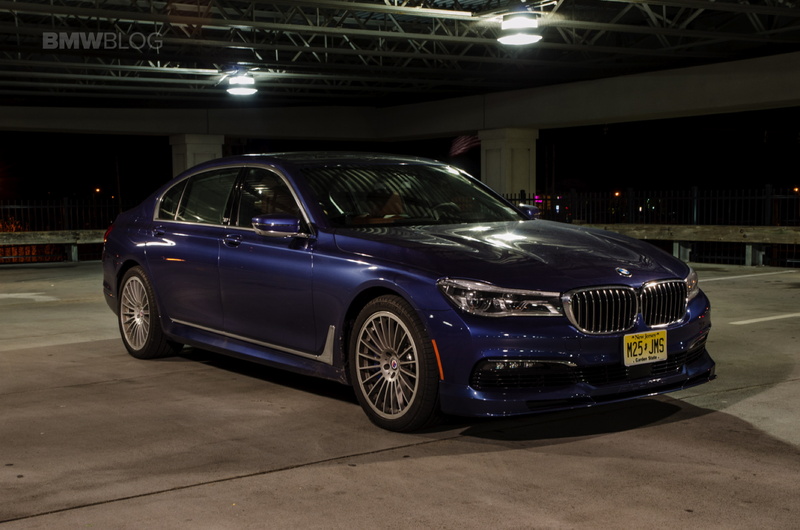 For years, I’ve been wanting to drive an ALPINA, any ALPINA. And for years, they’ve eluded me. The B7 had become my White Whale. Now, though, I had one directly in my sights and there was no chance I was letting it go. 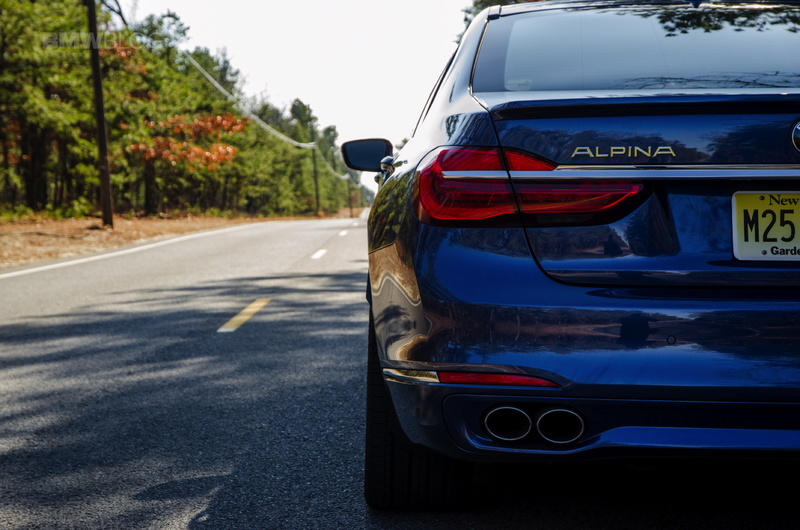 Walking up to the ALPINA B7 for the first time, I started to have my doubts. After hyping the B7 up in my head for so long, I began to wonder if it would fail to meet my lofty expectations. “Might I be disappointed by the car I’ve been waiting so long to drive?” Would it be my own doing for maybe expecting too much? 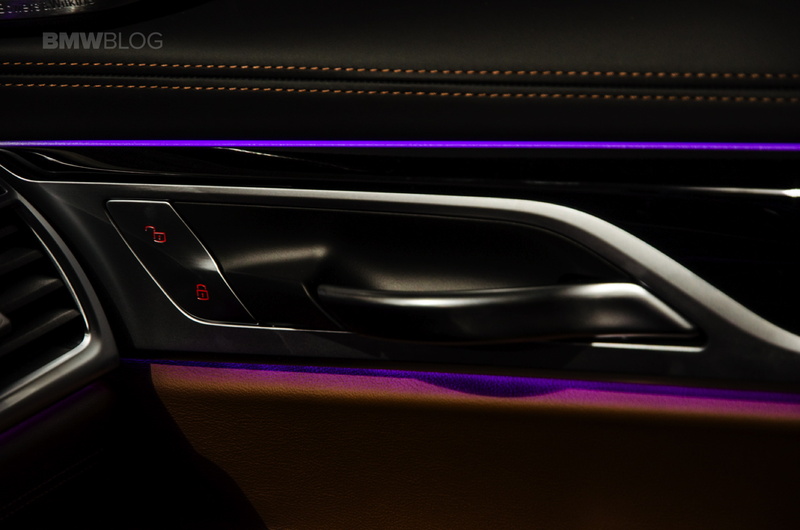 Could it just be a posh-looking 7 Series with a new badge? I was overthinking it, I just needed to get in and go. So I did and it didn’t fail to meet my expectations. It blew them to pieces, like the leather-lined cruise missile that it is. When you first step into the B7, you immediately realize that it isn’t just a posher 7 Series. It’s something special. 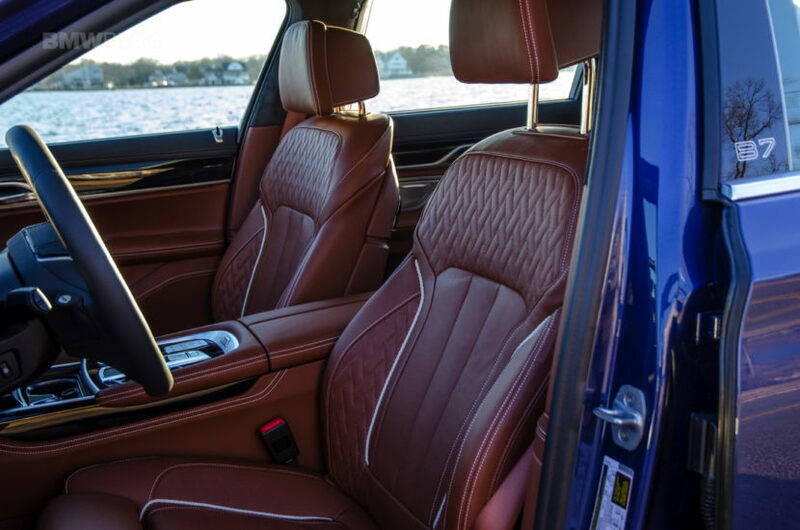 The smell of the Lavalina leather — a signature ALPINA feature — is intoxicating and feels incredibly expensive. BMW’s Nappa leather is very nice but this stuff is the tops. It’s lovely; both soft and durable. And the contrast stitching and piping is gorgeous. 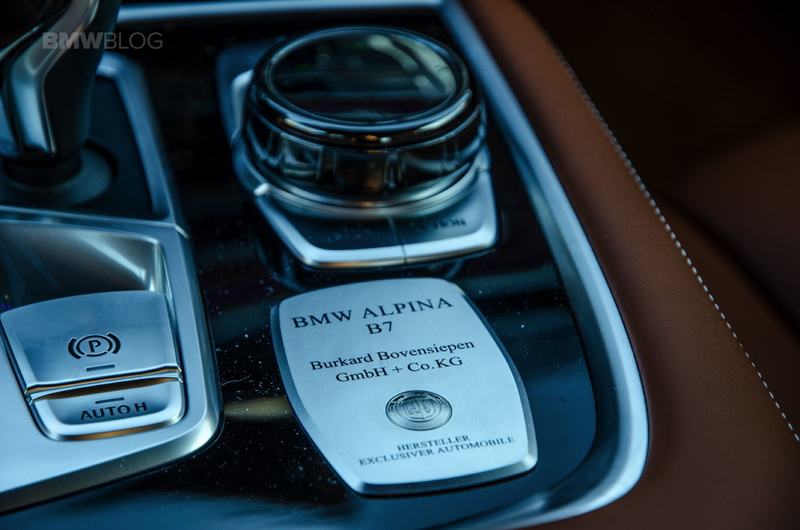 Then there’s the little ALPINA plaque on the center console, right next to the shift lever where you can see it every time you shift into gear. It’s a small touch but one that reminds you you’re in something special, something unique and something exclusive. 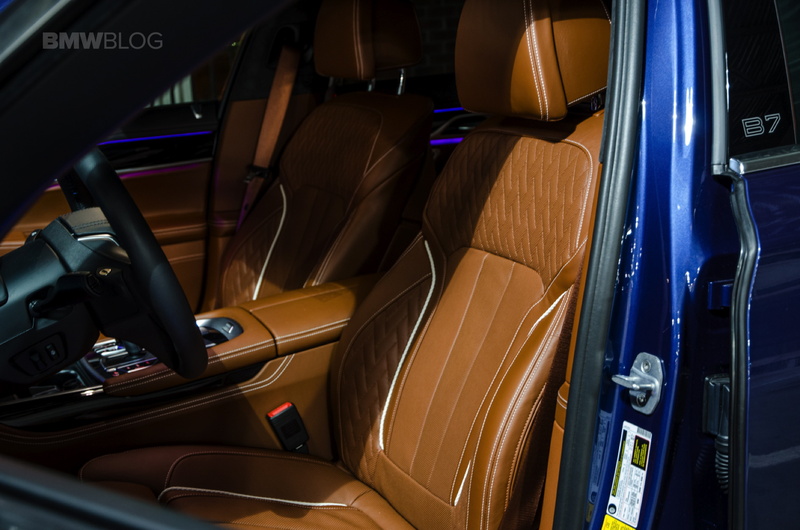 That, along with the little ALPINA badges on the dash trim and the carpets, makes it feel like something more than just a 7 Series. 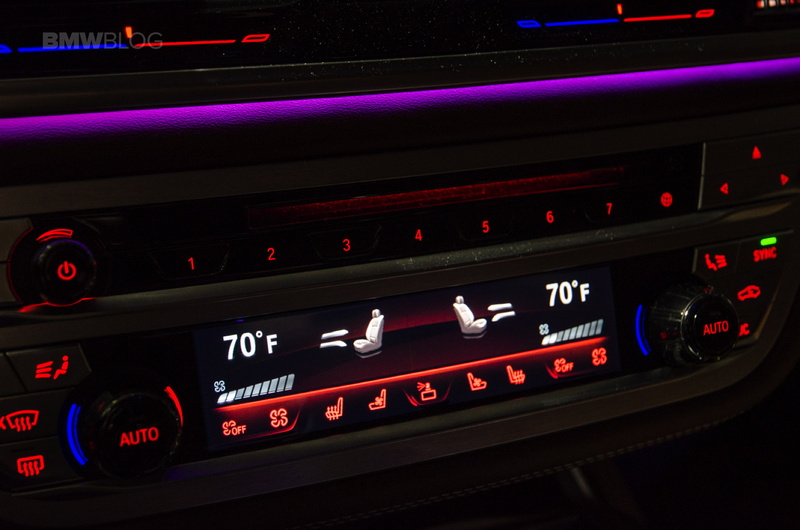 I also love how ALPINA changed the graphics in the digital gauges. 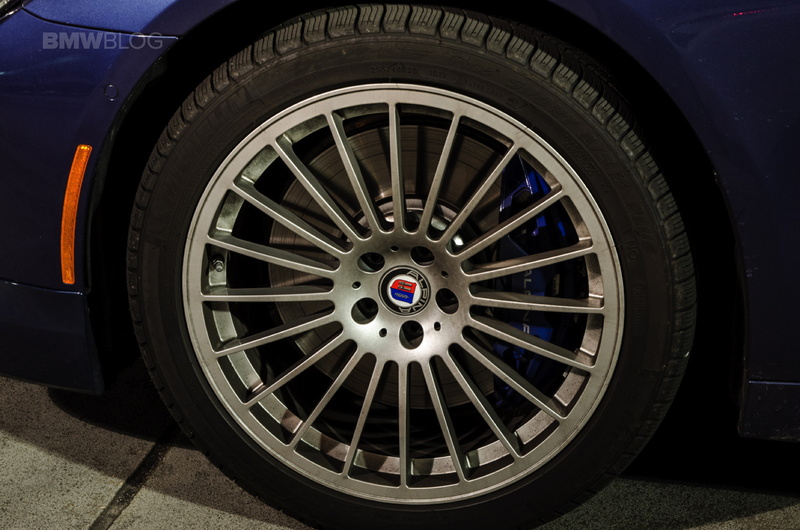 In Comfort mode, they look like traditional gauges, though in ALPINA’s blue and green color scheme. 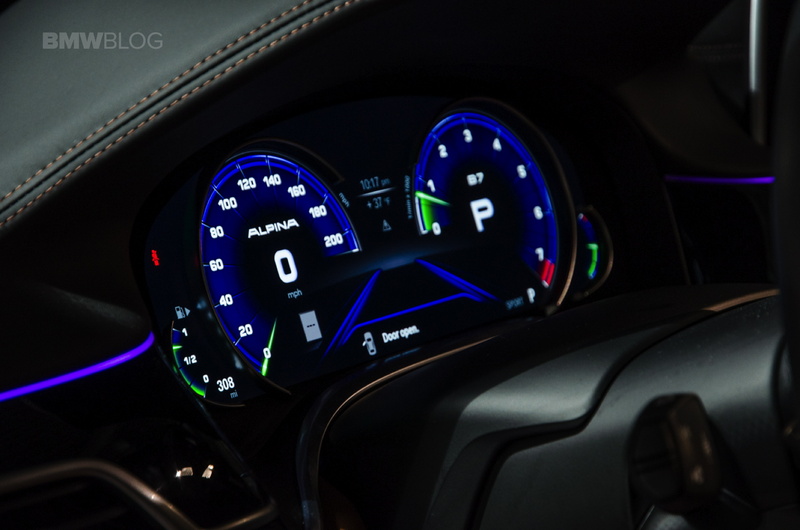 In Sport mode, you get the same set of sport gauges as in modern BMWs but, again, in a blue and green color scheme. Sport mode’s colors look really great and I kept it in Sport most of the time, almost specifically for that. Eco Pro mode actually just has the same eco gauges as the 7 Series but don’t use Eco Pro in the B7. It’s like putting a muzzle on a Lion. 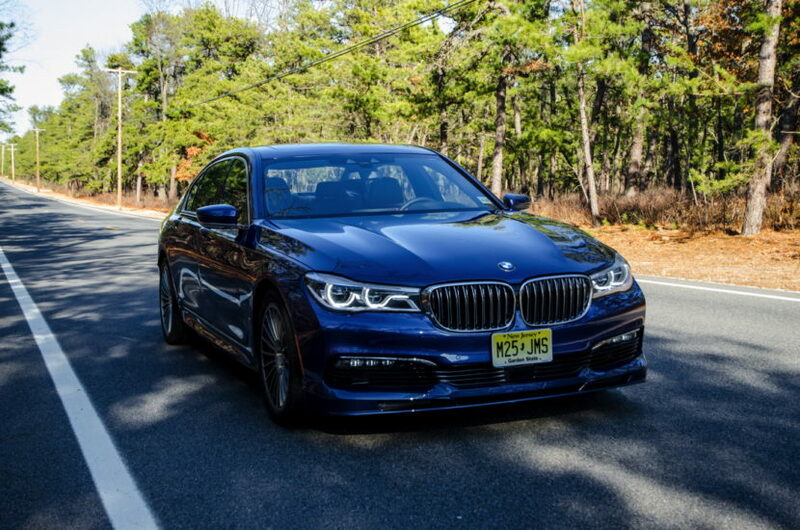 But the most special part of being inside of the ALPINA B7, or any ALPINA for that matter, is sitting behind that steering wheel. 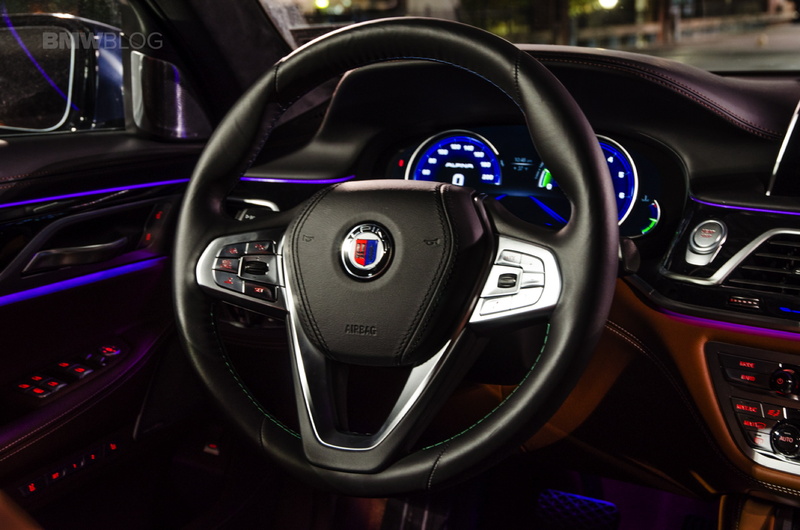 That’s because the steering wheel wears ALPINA’s logo and it’s a great one, one that reminds you of the brand’s rich history. Burkard Bovensiepen started out developing multi-carburettor systems for the BMW 1500 in the 1960’s. Burkard’s dual-Weber setup ended up receiving praise from BMW, so much so that BMW offered a full warranty on its cars that were fitted with Burkard’s carburetors. 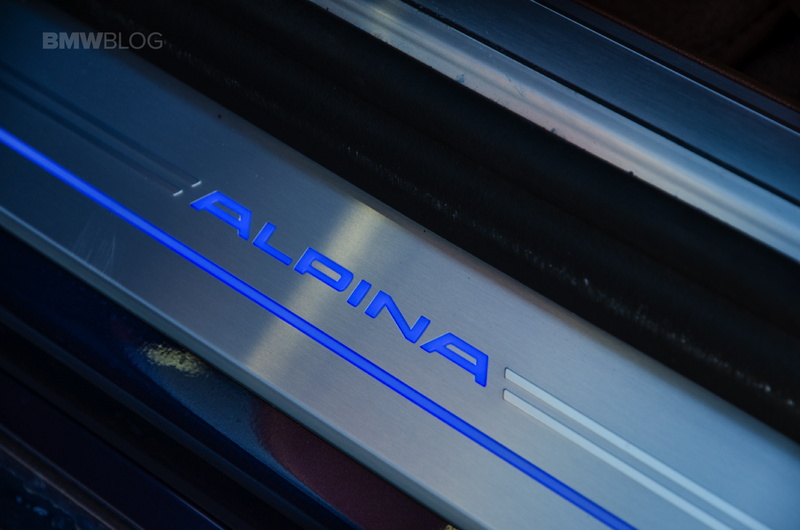 From there, the ALPINA name was created and the brand started. 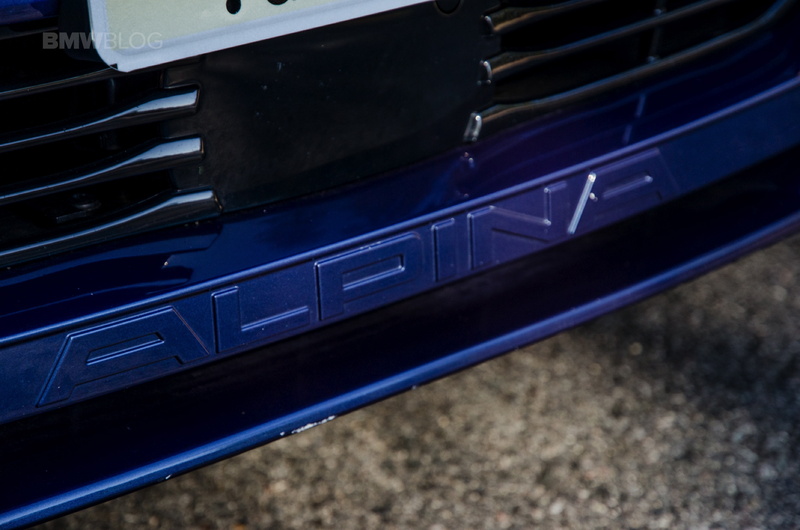 ALPINA then went racing and was even able to hire brilliant drivers such as Derek Bell, Jacky Ickx, James Hunt and Niki Lauda. 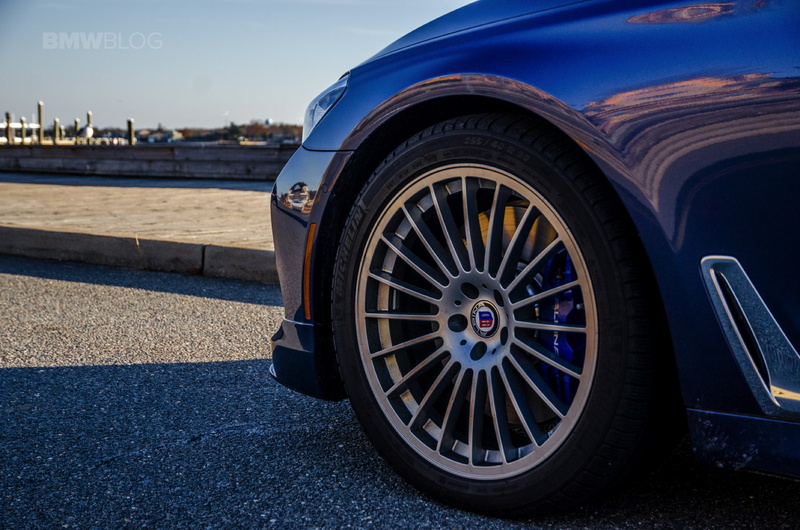 And after many decades of improvement and growing its relationship with BMW, ALPINA became the incredible brand it is today. And that logo, featuring two carburetors and a crankshaft, reminds you of that every single time you slip into the B7’s wonderfully sumptuous driver’s seat. 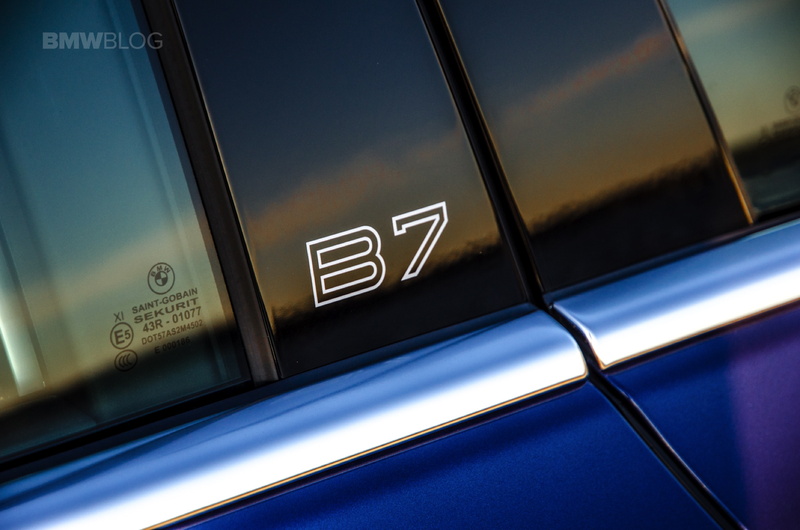 Yes, the B7 is as posh as a private jet on the inside, but its roots are humble and pure. And there’s something special about that. 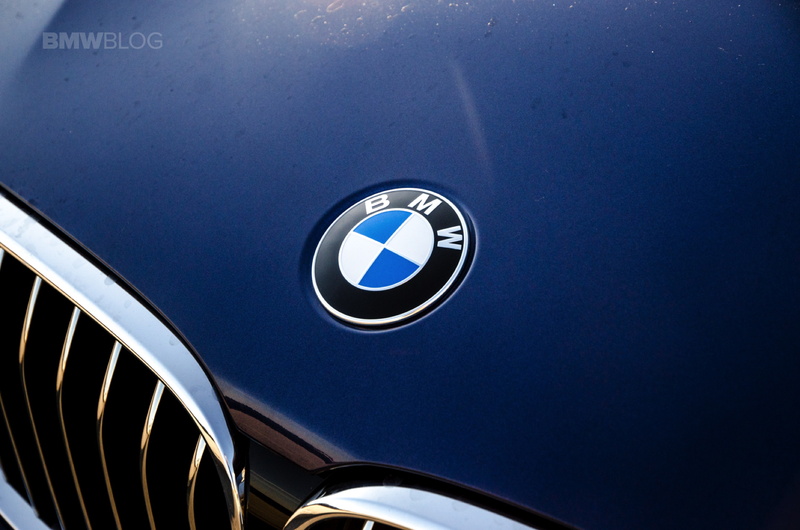 You can tell that this is a company that initially made its mark by making BMW engines smoother, more powerful and go faster from the moment you apply even a tiny bit of throttle. Under that heavily sculpted hood lies what can only be described as an armed warhead. 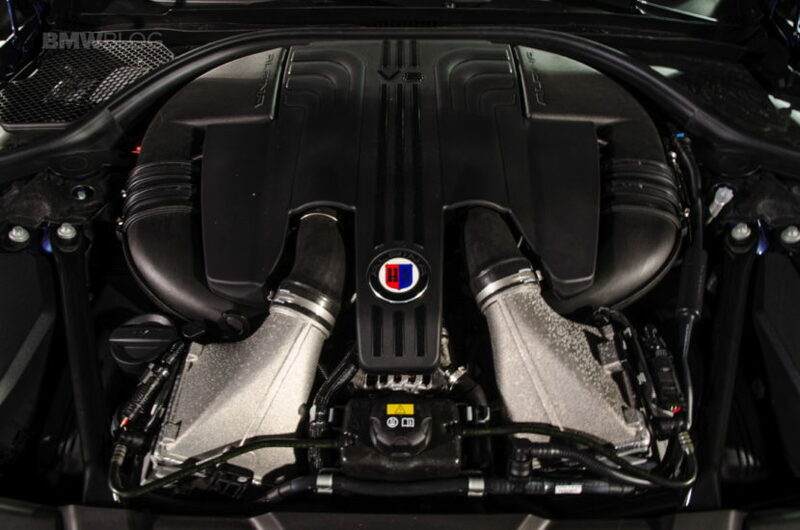 It starts off life as a BMW N63 engine, which is a 4.4 liter twin-turbocharged V8. 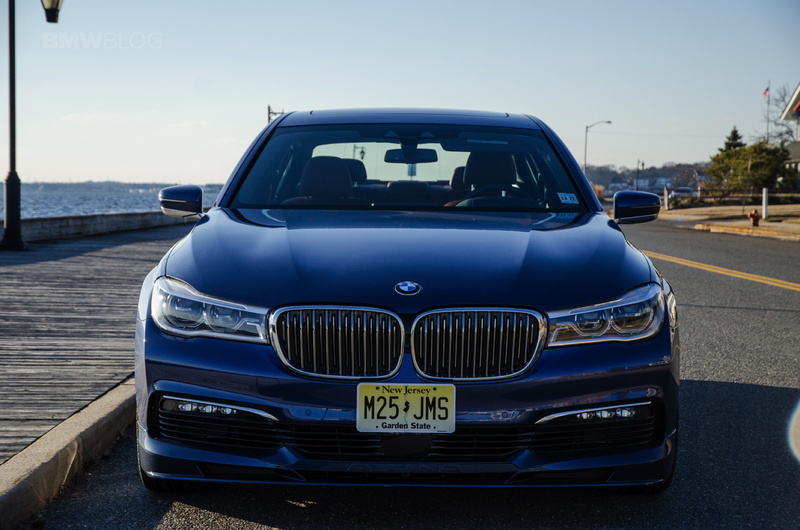 In the BMW M550i, that engine makes 456 hp and 480 lb-ft of torque. That isn’t good enough for a company that bares the Bovensiepen name. 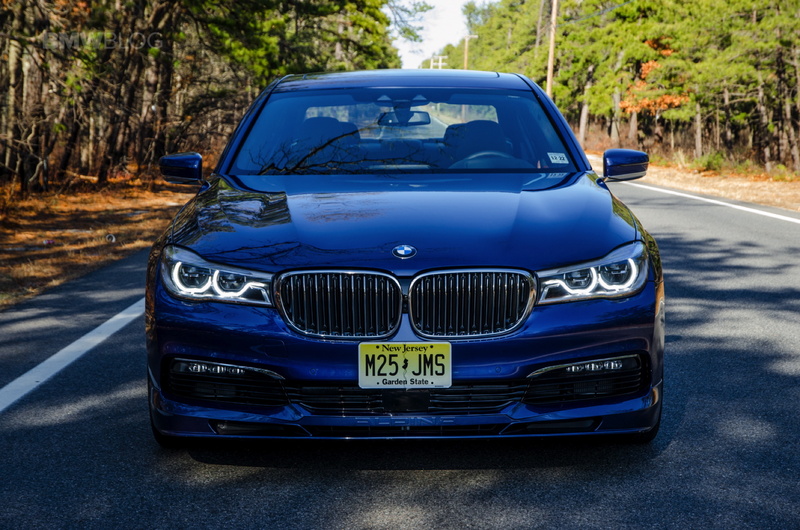 So while it starts out life as the same engine you’ll find in almost any “50i” labeled BMW, it’s so much more in the B7. It gets new Mahle pistons, a forged steel crankshaft, a completely revised air intake system for maximum airflow, larger radiators, an indirect air/water/air intercooler and larger turbochargers. The end result is 608 hp and 590 lb-ft of torque, the former comes in at 5,750 rpm and the latter at 3,000 rpm. 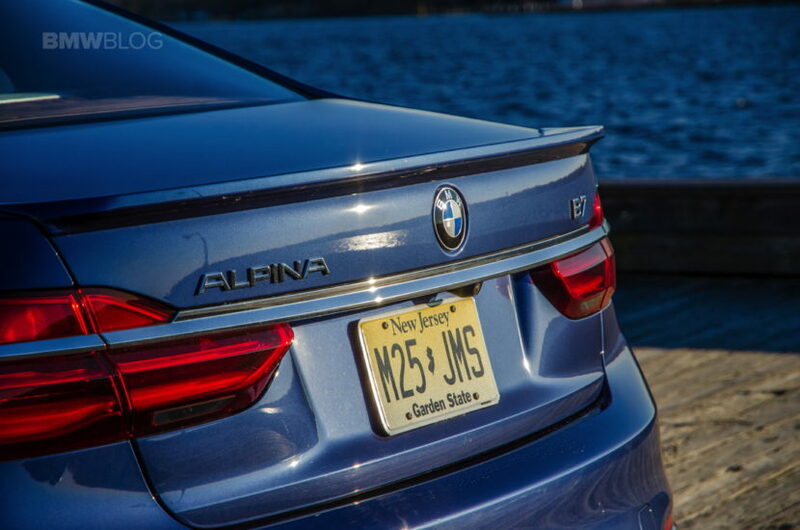 ALPINA claims 0-60 mph in 3.7 seconds. If in reality it was more like 3.2 seconds, I wouldn’t be surprised a bit. 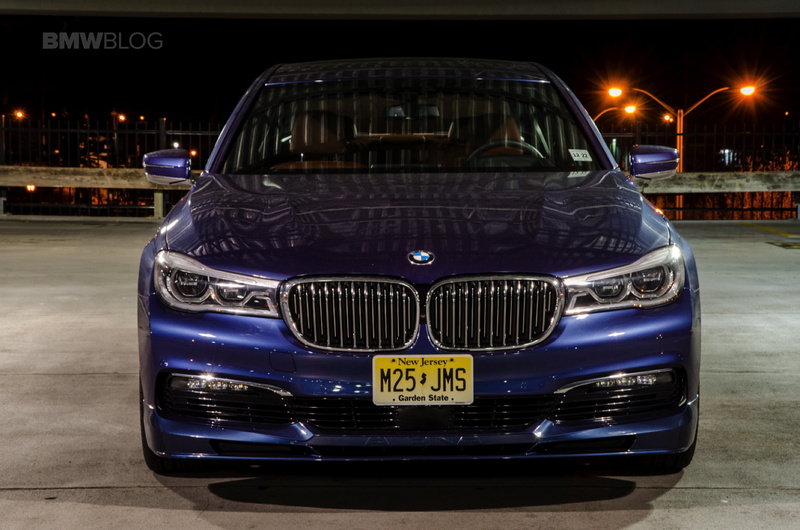 It’s also claimed to have a top speed of 205 mph, which is absurd in a car as large as the B7. Absurd but fantastic. 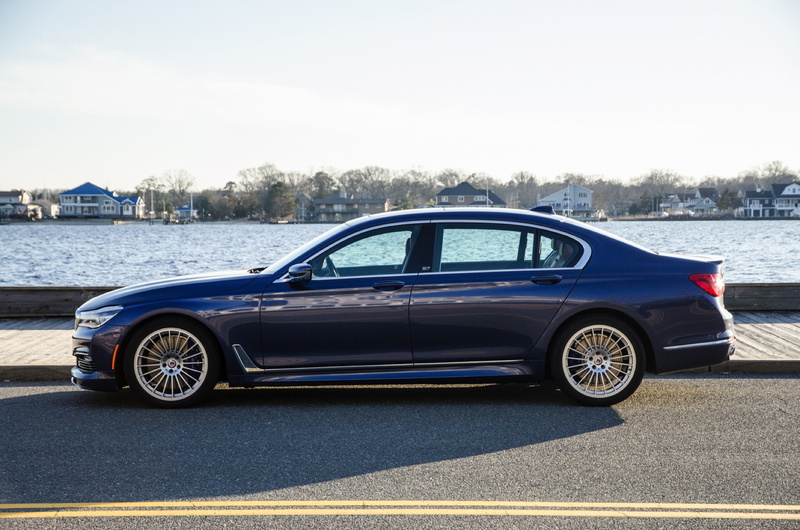 That monstrous engine is paired with an ALPINA-tuned variant of the same ZF-sourced eight-speed automatic gearbox that’s found in almost all BMWs. It’s been tuned for not only sharper shifts but smoother shifts. And it’s worked. Mash the go-pedal and the horizon approaches with such speed you’d think you hit the Lightspeed button on the Millennium Falcon. White and yellow painted lines in the road begin to look like stars in galaxies quickly whizzing by and you feel your internal organs begin to tenderize. It’s brutal and violent and superb, all while being incredibly refined. There’s a bit of induction growl and some exhaust bark but, aside from that, it’s a sensationally quiet car, even when eviscerating supercars on the road. And eviscerate, it does. 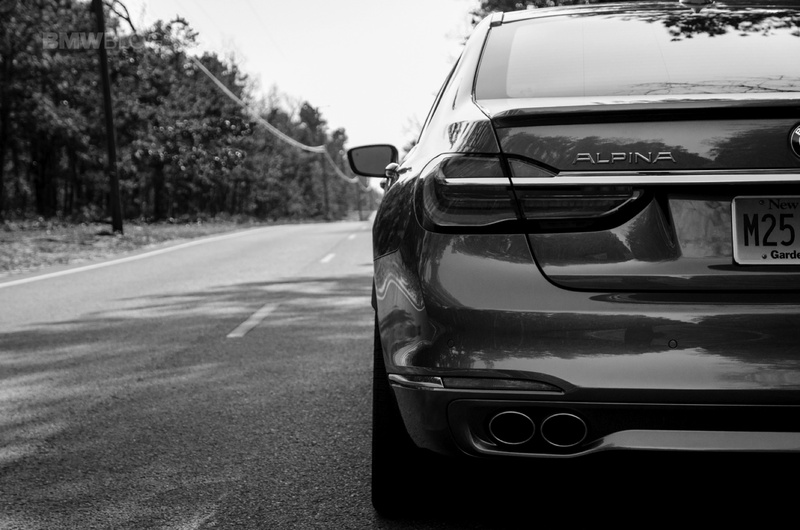 Pull up next to anything on the road, seriously anything, and the ALPINA B7 is almost certainly faster in the real world. Would a Nissan GT-R be faster in a drag race? Sure, with launch control and on a prepped surface. What about a Ferrari 488 GTB? In the right conditions, absolutely. But on a public road, with an imperfect surface, in traffic and at traffic lights, I’d put my money on the B7. 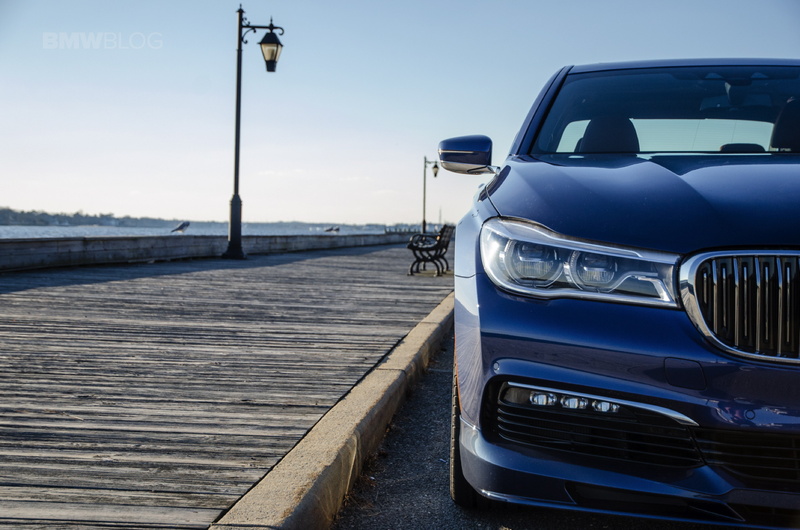 There’s a touch of lag under 2,000 rpm but a bit of brake-torquing can completely mitigate that and, once on boost, then the B7 becomes a road-going missile that can’t be beat. During my week with it, I genuinely had fun finding high-performance cars to hunt down and destroy. And I never lost. 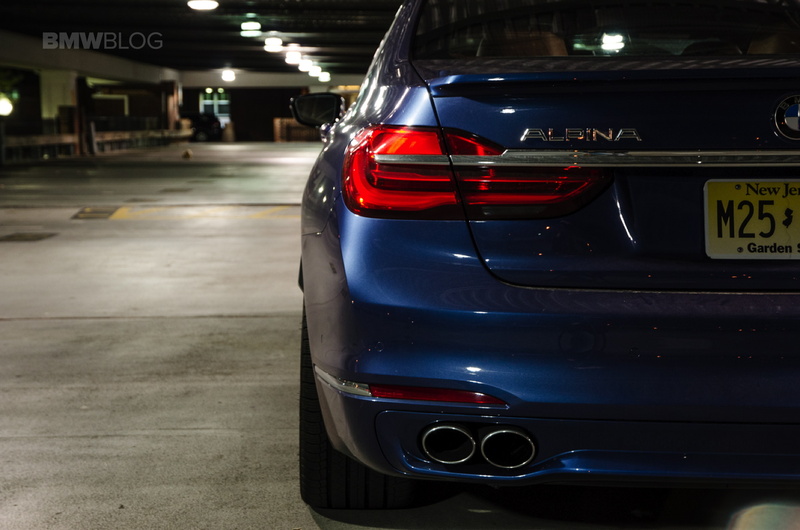 ALPINA made its bones building and tuning engines. 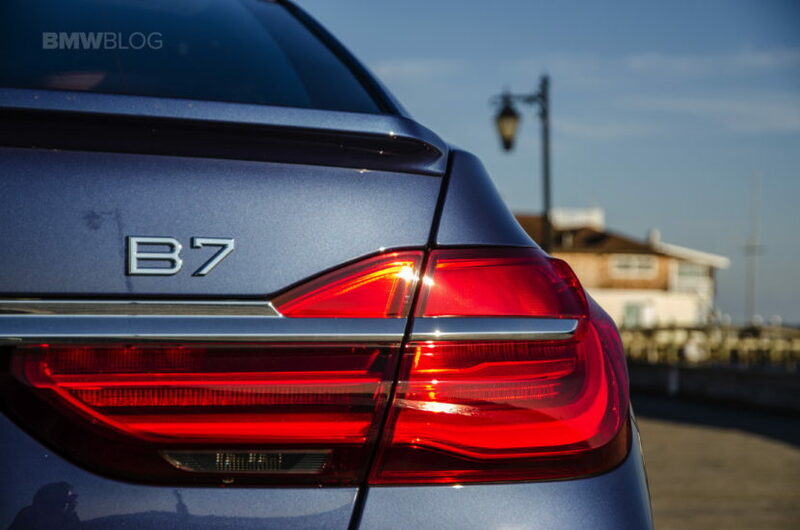 Decades of improving and refining the same philosophies are apparent, as the B7’s Biturbo engine is a masterpiece. 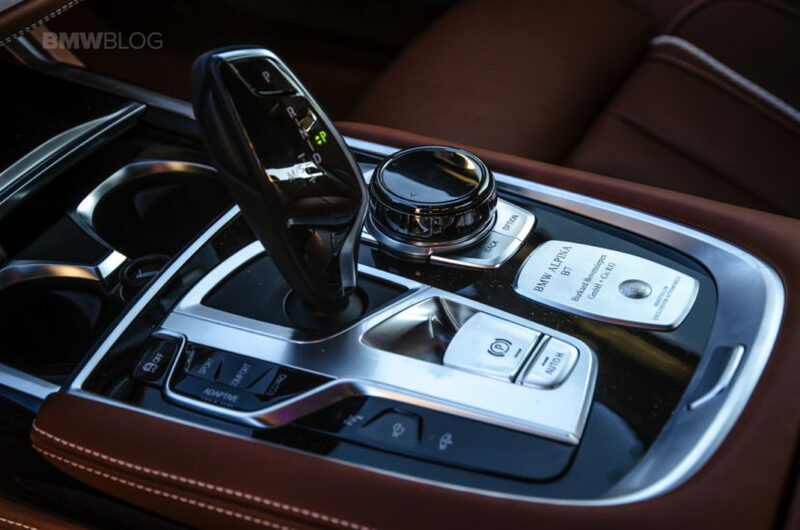 That eight-speed gearbox is mated to an ALPINA-tuned version of BMW’s xDrive all-wheel drive system and rear-wheel steering. The two different all-wheel technologies work together to create a genuinely surprising handling car. 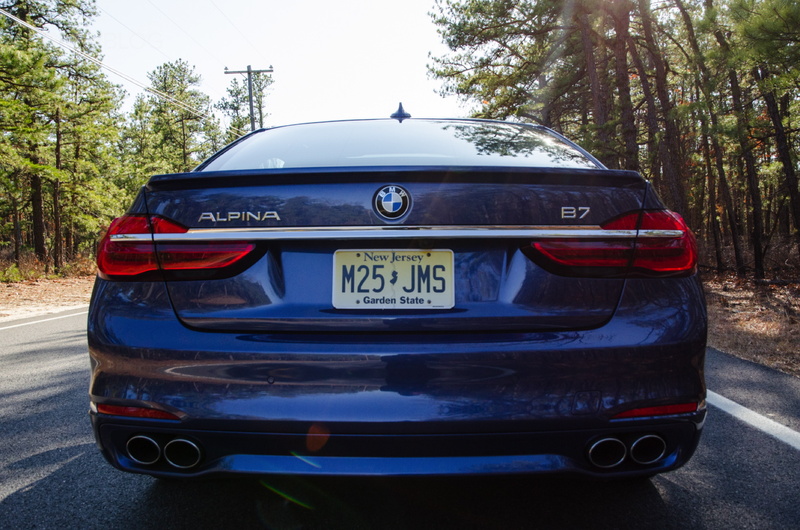 I’ve never driven such a large vehicle that’s as much fun as the ALPINA B7. Its steering is sharp and accurate and there’s just so much front end grip. Is the steering numb? 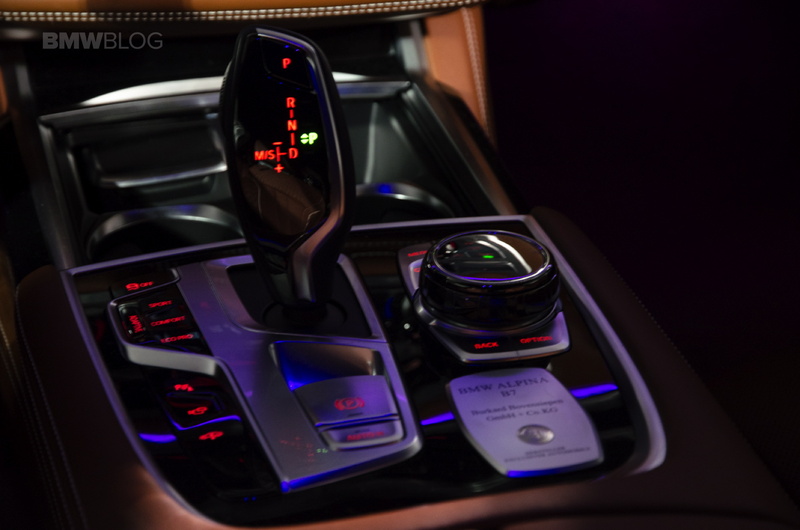 Of course, it’s a massive luxury car and it’s not designed to drip with feedback. Having said that, it goes exactly where you point it, as soon as you point it. Can’t really ask for much more than that. The rear-wheel steering has a lot to do with how sharp and agile it feels. It can turn the wheels slightly in the opposite direction of the front wheels at low speed and in the same direction at high speeds. 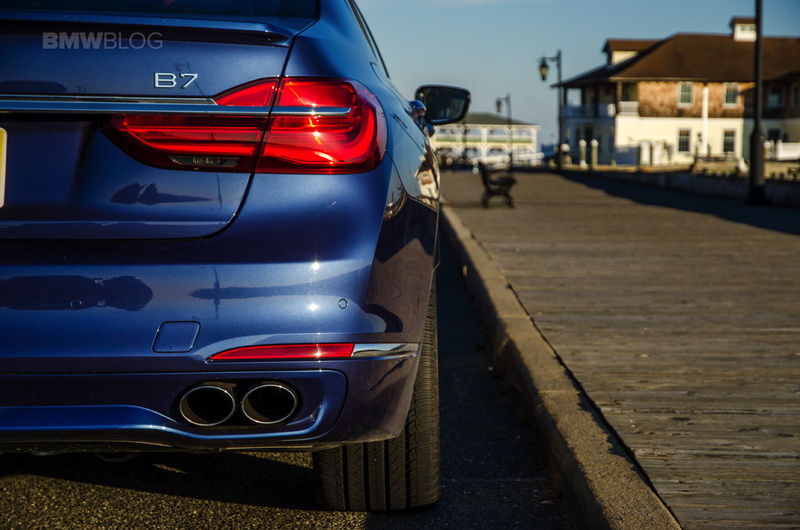 At low speeds, it effectively shortens the wheelbase of the very long B7, making it feel like a much shorter car. And at high speed, it provides better stability. 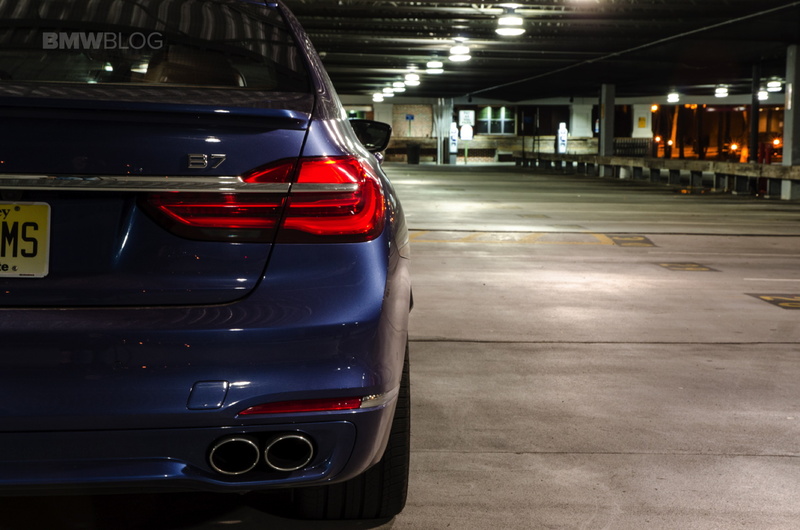 Both are evident when you push the B7. At low speeds, the car really does shrink around you. 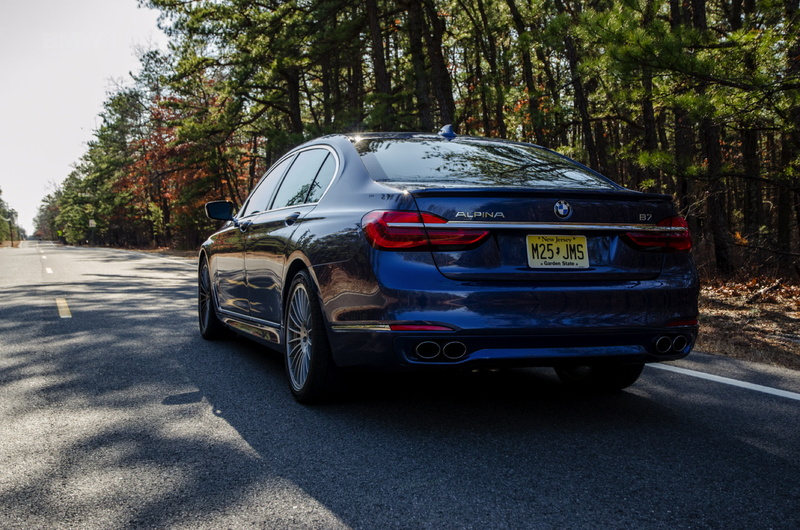 As much as that’s an overused expression in the automotive journalism industry, it rings true with the ALPINA B7. It looks enormous from the outside and when you sit in it, the cabin feels vast. But once you set off, it begins to feel a lot smaller than it is, making it fun and easy to hustle a twisty back road. 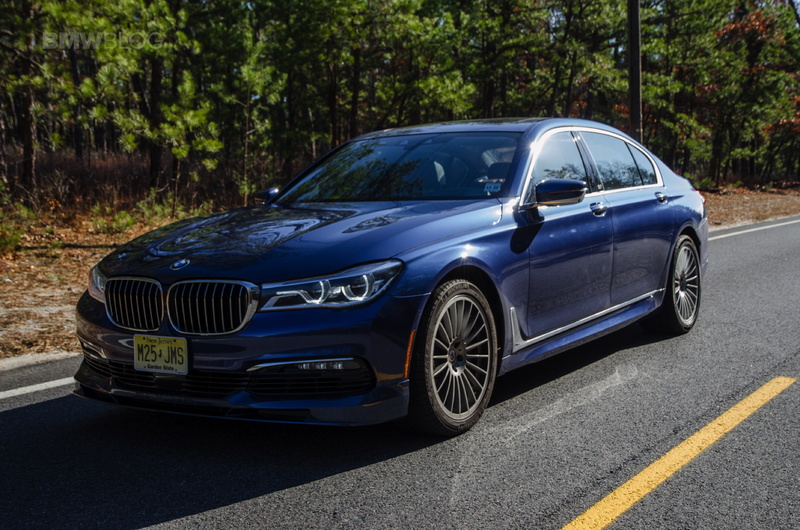 In fact, it feels like an old-school BMW 7 Series, with better balance and feel than the current 7 Series. 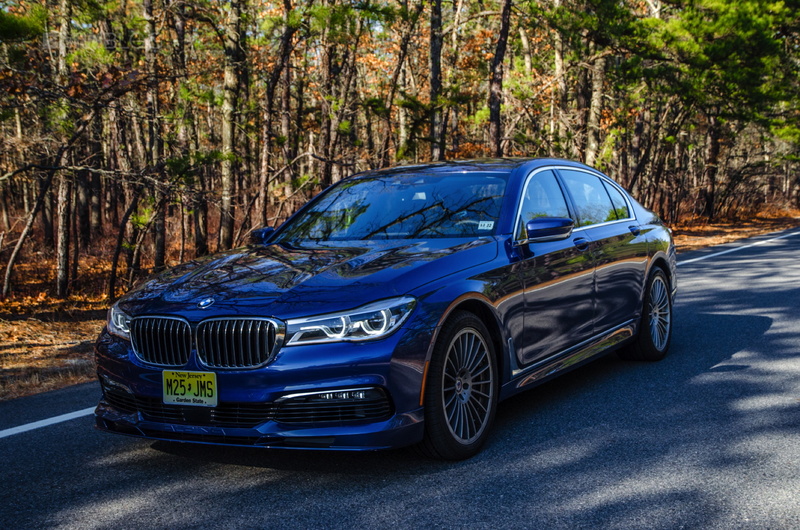 And because of the tremendous grip from the ALPINA-tuned xDrive all-wheel drive system, you can push much harder than you’d expect from such a big luxury car. And the car we had was shod with all-season Michelins, so its grip can improve with a more aggressive tire setup. 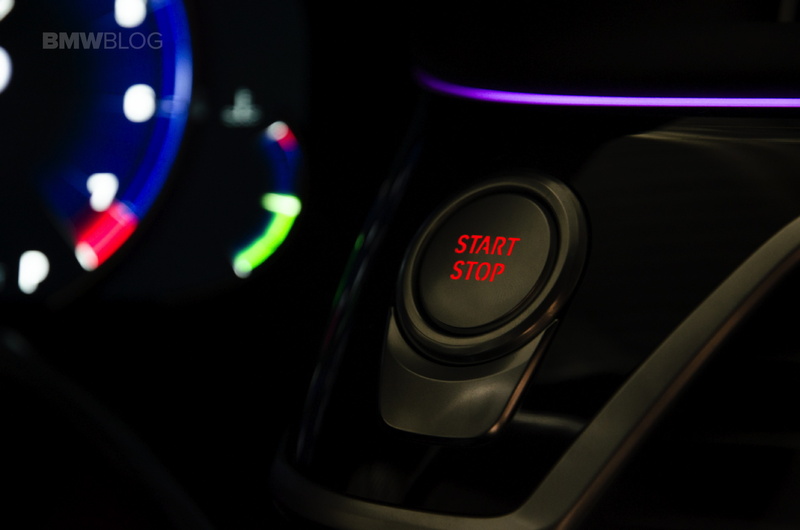 But turn the car in, it’s met with a touch of body roll to let you know what the car is doing, the weight will transfer and settle quickly, then get back hard on the gas and it digs itself out of corners and fires ahead. It’s brutal but effective and incredibly satisfying. 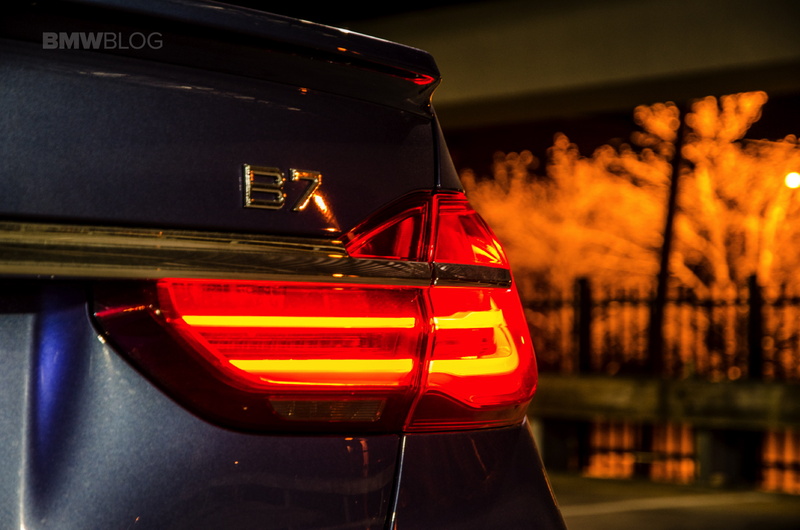 On the highway or at high speed, the B7 really shines, as that’s what it’s been designed for. 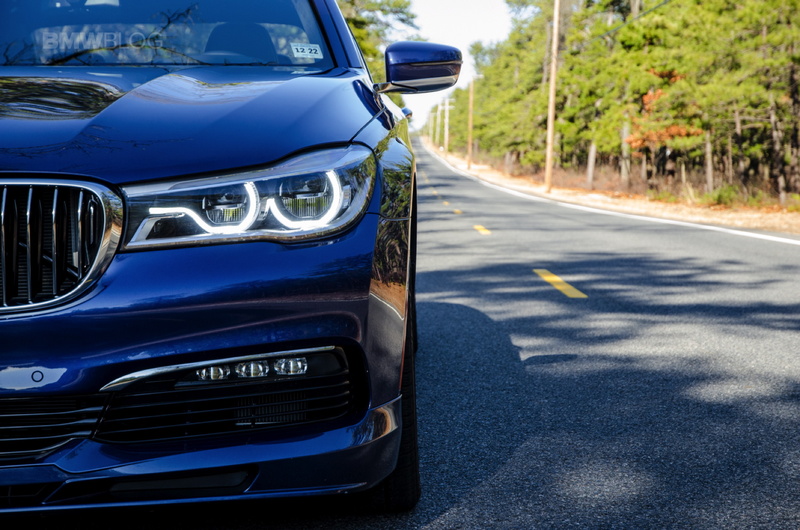 Speed doesn’t matter to the B7, it feels as steady and as stable as a desert rock formation. Driving the B7 at 120 mph barely feels any more taxing than 20 mph. It’s astonishing. Not only that, but it’s supple, comfortable and relaxed without every feeling floaty or out of control. It’s also quiet, whisper quiet. Under 100 mph, there’s not much road, wind or tire noise to speak of. 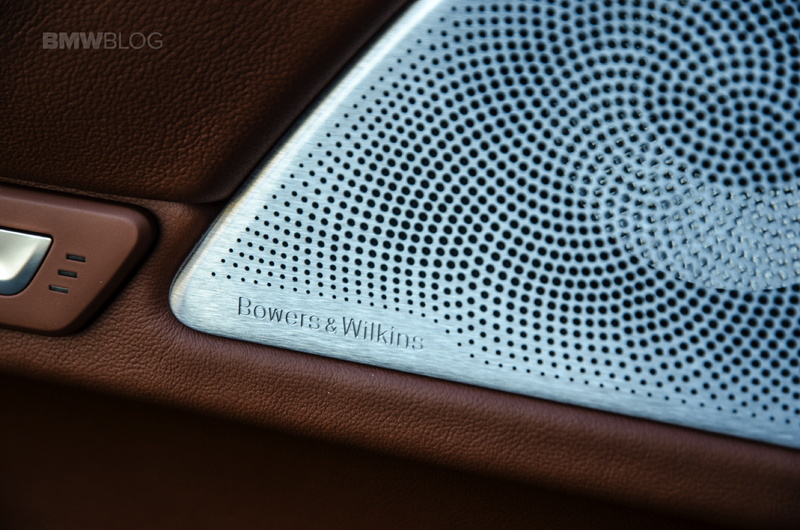 When some noise does make its way into the cabin, though, you can drown it out with the brilliant Bowers & Wilkins surround sound system which may very well be the best sounding in-car system these admittedly inexperienced ears have ever heard. It’s superb, with crystal clear sound no matter the volume and no matter the song. Listening to a familiar song, you’ll notice things you’ve never heard before. Its sound is that clear, that deep. 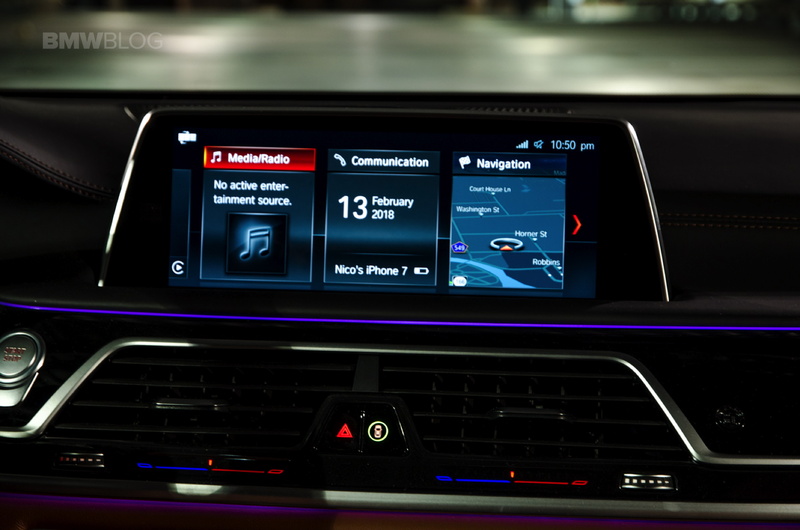 And that B&W surround sound system is only one of the various bits of tech in the ALPINA B7. 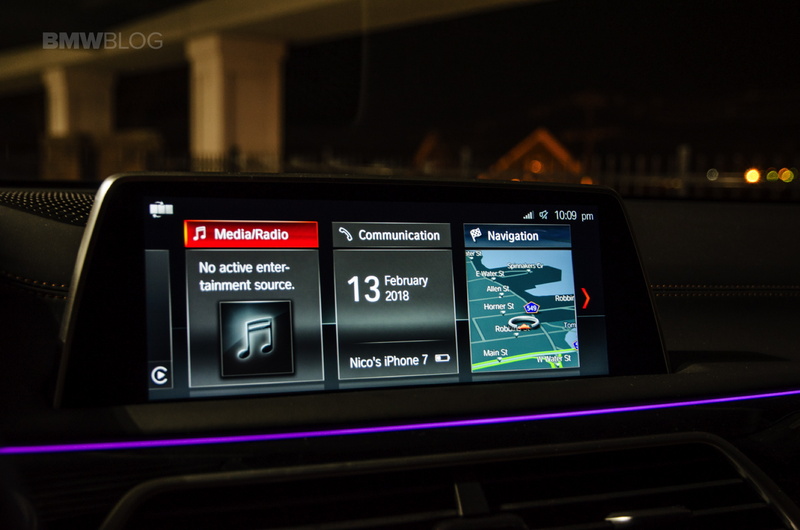 Being based on the standard 7 Series, the B7 packs the same new iDrive system, with touchscreen and Gesture Control capability. As in every other BMW, it’s the best system in the business. 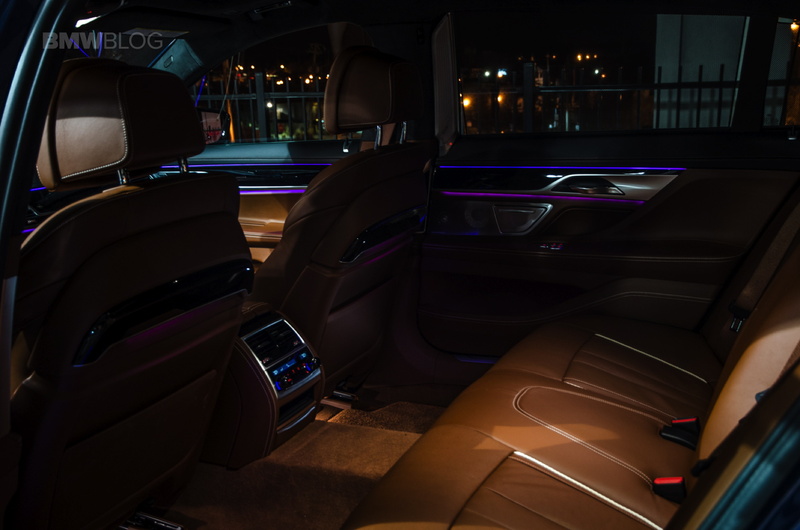 The B7 also sports an in-car fragrance dispenser like the 7er, which allows it to make the cabin smell pretty by gently sending specific fragrances through the air vents. Out test car came with four different scents to test and the smells are subtle but nice. 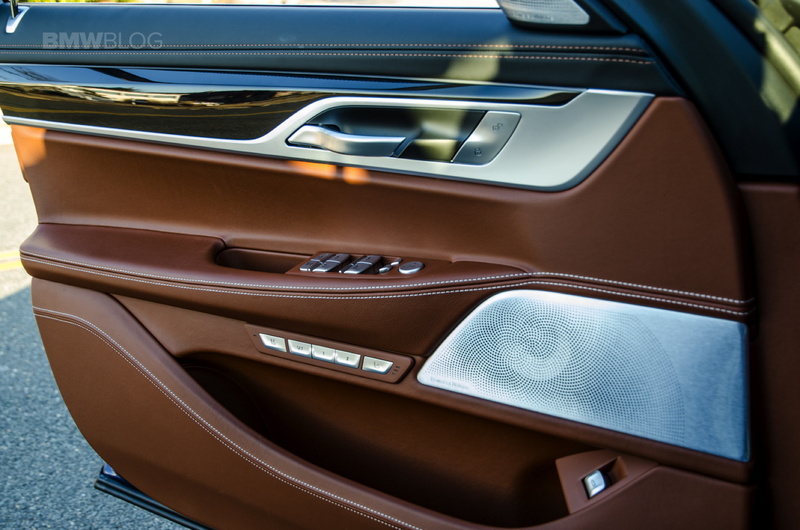 It allows you to have a nice smelling interior without overdoing it. 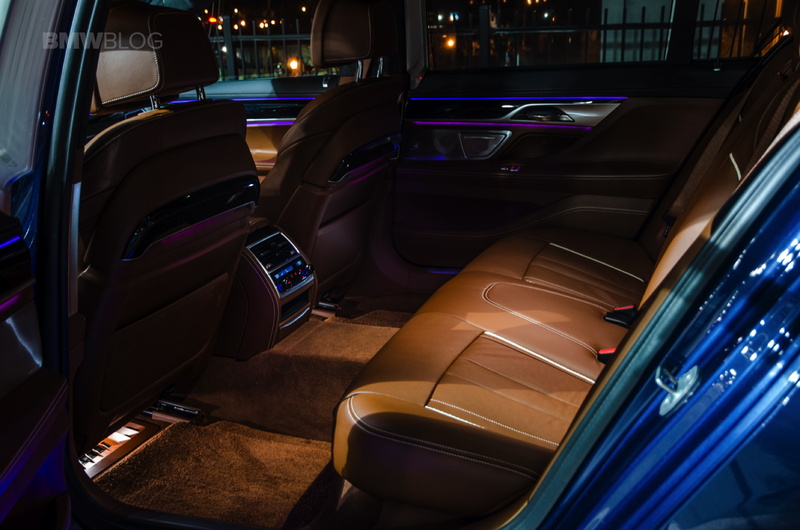 While our car didn’t have the optional rear seat entertainment package, which brings screens on the front seatbacks and a tablet in the rear armrest, it is optional and it makes the rear seat as opulent as a private jet. 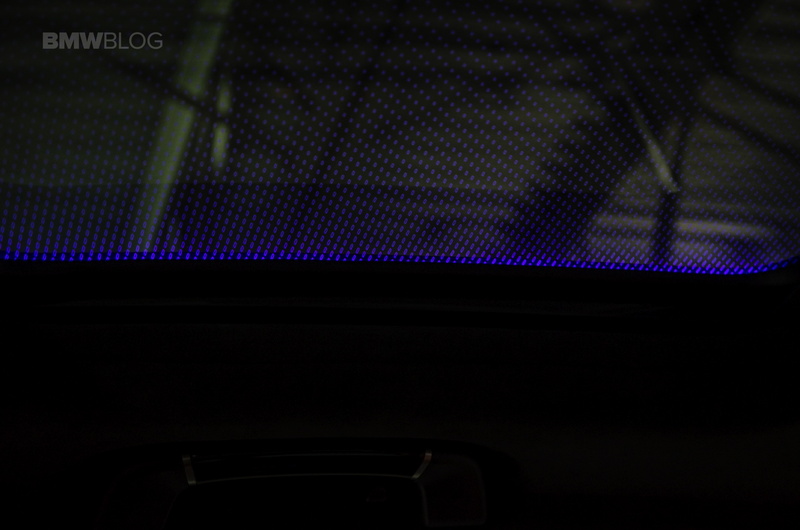 There’s also enough interior ambient lighting to make a Vegas nightclub jealous, including little lighted bits in the two sunroofs, which looks fantastic at night. I’ll be honest with you. I’m not in love with the new BMW 7 Series. 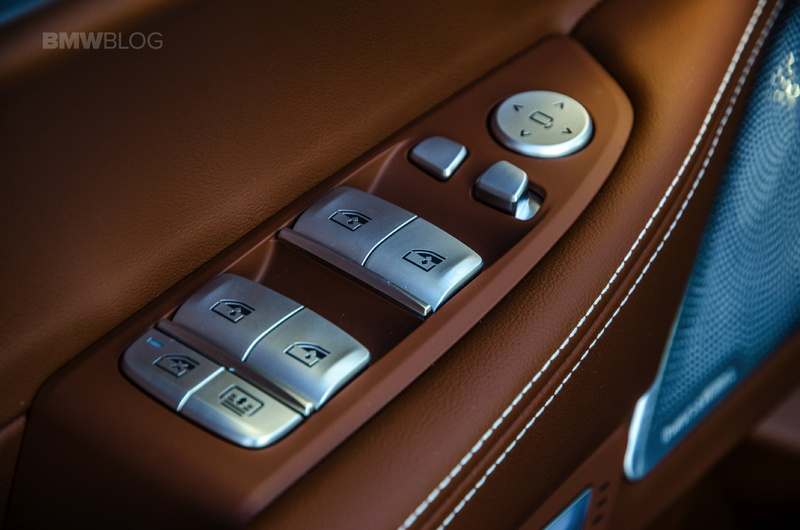 It’s a very good car, one that is comfortable, luxury and surprisingly good to drive. But there’s nothing about it that gives me the fizz. It’s not the best looking luxury car in the segment and it’s just a bit clinical. It’s good but it doesn’t feel special. At least to me. 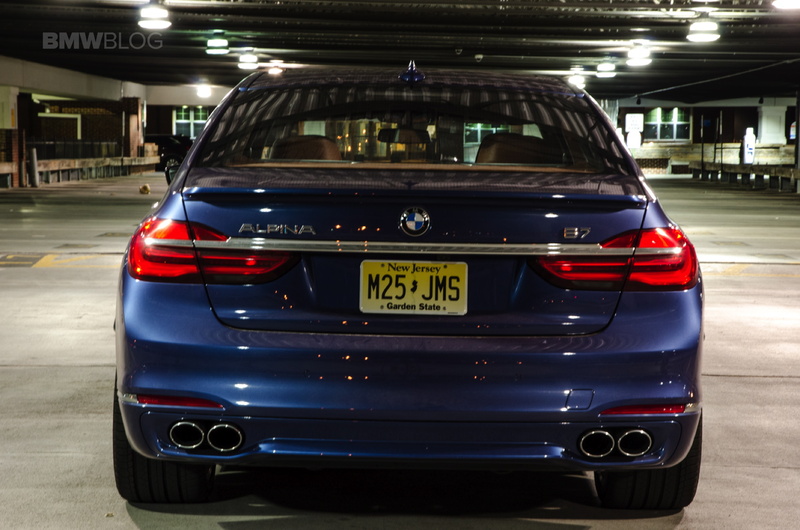 Having said that, the ALPINA B7 does not feel like a 7 Series. 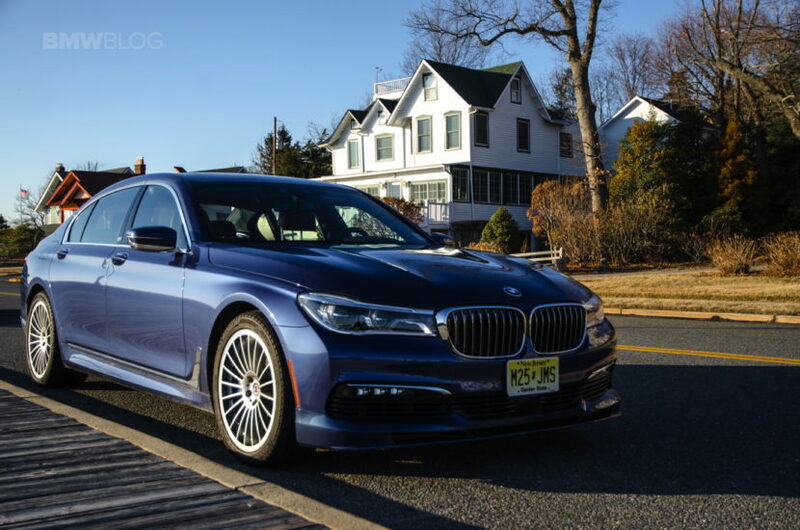 It looks better than the standard car (despite not actually being much different), it has a more special feeling interior thanks to its incredible leather, new gauges and ALPINA badges throughout, and the way it drives makes it feel like a different car from the 7 Series. 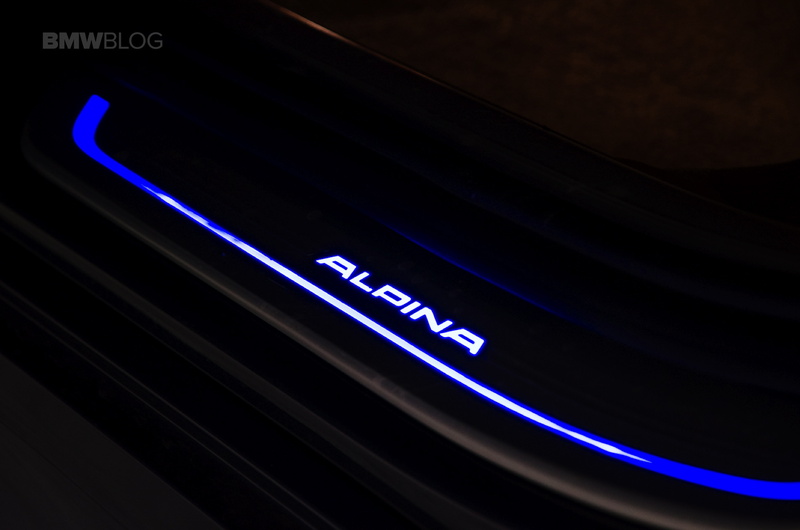 The APINA B7 is already in contention for the best car I’ll drive in 2018 and I drove it in February. It’s an astonishing machine. 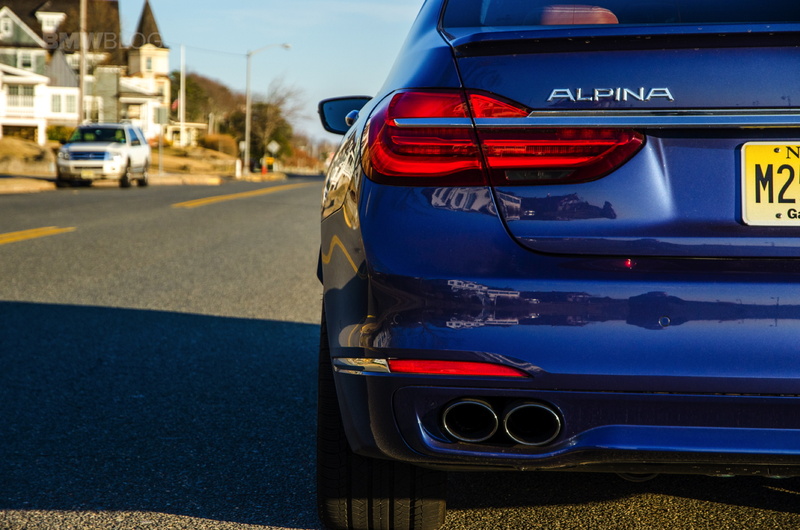 With weapons-grade performance, executive-level luxury and genuinely fun, dynamic handling, the ALPINA B7 can literally be all things. 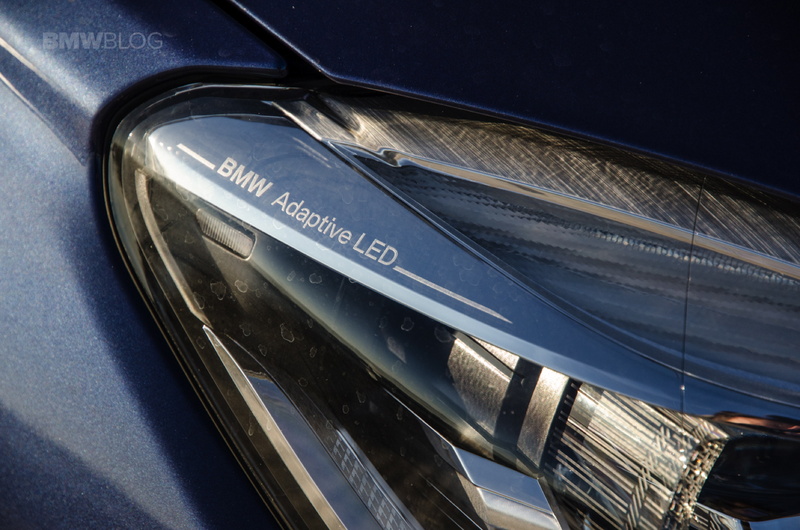 Not only is it unbelievably capable but it has that intangible quality that makes a car great. As a performance luxury car, I don’t think there’s better. 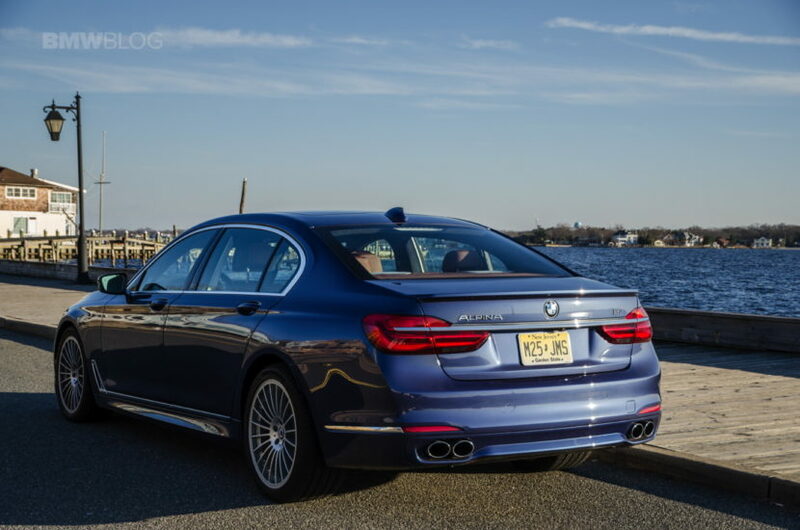 The ALPINA B7 is so much more than just a standard 7 Series. 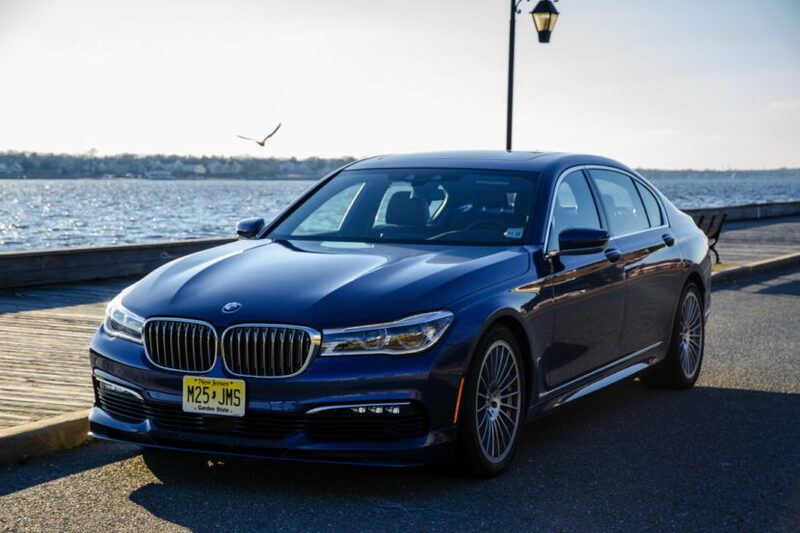 It's a 7 Series that's been enriched and enhanced to the point of being weapons-grade and it feels so much more special. As a luxury-performance car, I don't think there's better.